As the Jumeirah Mosque in Dubai is built in quasi-Fatimid (Egyptian) style it is reminiscent of the great mosques of Cairo. 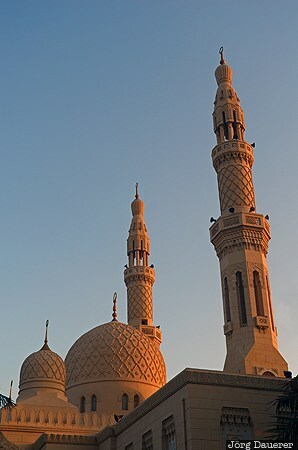 The image shows the minarets of Jumeirah Mosque illuminated by warm morning light. Dubai is the Emirate of Dubai, United Arab Emirates (UAE). This photo was taken in the morning of a sunny day in March of 2012. This photo was taken with a digital camera.